It also echoes Fauzia’s earlier blog on Malala and International Aid Politics. Lack of educational opportunity for Afghans, especially Afghan girls, has been a highly controversial topic that has been used as a tool to serve political agendas for both the Western powers and the Taliban. For the US and its allies, bringing education to children—and especially girls—became a propaganda tool to partly justify invasion and occupation of Afghanistan. For the Taliban, education has been seen more as a detested mechanism of Westernization and secularization of Afghan children. Taliban members in Afghanistan and Pakistan have fought it every step of the way, going so far as attempting to assassinate teenage activist Malala Yousafzai as she was returning home from school. According to official (bipartisan) party line, one of the main reasons for the US-led invasion of Afghanistan was the Taliban’s mistreatment of women’s rights. Anyone watching or reading the news could not avoid the harsh images of Afghan women in full burqa being shot in a soccer stadium full of men. Girls not being able to attend school and many other violations of human rights were used to justify the war. During the rule of the Taliban, “young girls were forbidden to enter educational institutions after the age of eight” and anyone breaking this rule risked severe punishment or even execution. One would have thought the Western occupation of the country would be an improvement. 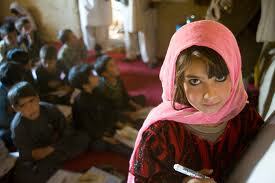 And yet thirteen years later there isn’t much real improvement for the girls and women of Afghanistan. Many promises were made by the Bush administration regarding support of education. On a visit to Kabul, Mrs. Bush promised millions of dollars and a long term commitment to education for Afghan women but unfortunately this “was not for Afghan public education (or women and children) at all, but to establish a brand-new, private, for-profit American University of Afghanistan catering to the Afghan and international elite.” The former finance minister and president of Kabul University stated: “You cannot support private education and ignore public education.” The aid money is given to American private contractors who have no real stake in education for the average Afghan but rather making a profit. The Western media sensationalizes a young girl shot fighting for her right to education and assumes moral high ground— then at the same time the US government uses drones to kill these children. The Taliban, on the other hand, connects girls’ education, learning and knowledge, to westernization—as siding with the invaders and occupiers—thus feeling justified to kill and maim. When the world should have viewed her as a child, they made her a symbol. Rather than caution her on diplomacy, the world encouraged her brazen outcries. Rather than protect her, the world exalted her. And when she thought the world was with her, the world made her a martyr. Now, as she recovers from nearly fatal gunshot wound that ripped through the throat that pushed so many strong words and cracked the skull that housed the mind she treasured above all her possessions, the world explains away their moral culpability and their complicity in the machine that nearly killed Malala Yousefzai.